Lonely Kamel's second album "Blues for the Dead" was one of my first review's here at Heavy Planet (although not one of my best, Lonely Kamel was the first of the bands I would write up that truly impressed me). Their heavy blues inspired groove rock was just the shot in the arm I needed to have faith that new bands could make classic rockin' jams. Fast foward a year... Lonely Kamel has signed with Napalm Records, hit the road.. a lot (thanks to S.O.L. ), and released their third album Dust Devil. 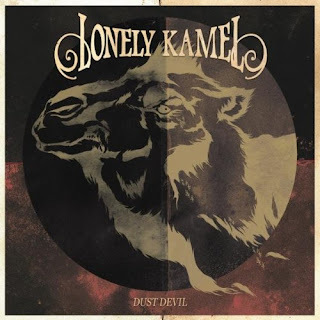 Lonely Kamel, doing what they do so well, kept with the hard rockin', stoner blues and added depth with (and I quote) "two spoonfuls of doom and psychedelia". Don't worry though, the doom and psychedelia did not make the guys too serious. Dust Devil is a bag full of fun! Grim Reefer kicks things off in typical Lonely Kamel style, with a catcthy blues driven riff, a drag of fuzz, and some southern soulful rock. No show-boating here, just something to bob our heads too. Seventh Son is one of the (few) darker tracks Lonely Kamel have released. A frightening bass-line and eerie sound of wind blowing greet us, while Tomas croons for the top, "away from the Seventh Son". Lonely Kamel's dabbling in doom have paid off greatly, adding a new variety to the drinkin', smokin', and partyin' tunes. Speaking of drinkin', smokin', and partyin'... where would be without a little something to get the blood flowing? That's where Roadtrip With Lucifer comes in... and it rocks, simply rocks! "Like a two-headed bison" Lonely Kamel run us over with a melodic groove, fiercely spit lyrics, and enough hooks to keep cruisin'. I'm glad to be here again, writing about an excellent band that knows how to have a good time... and luckily writes the soundtrack. So, go out and grab a bottle of your favorite poison (I suggest a Vermonster), Lonely Kamel will provide the blues and the grooves.